Prince What? — Ginger writes. We are taking the four weeks of Advent off from doing our regular Sunday night story circle. 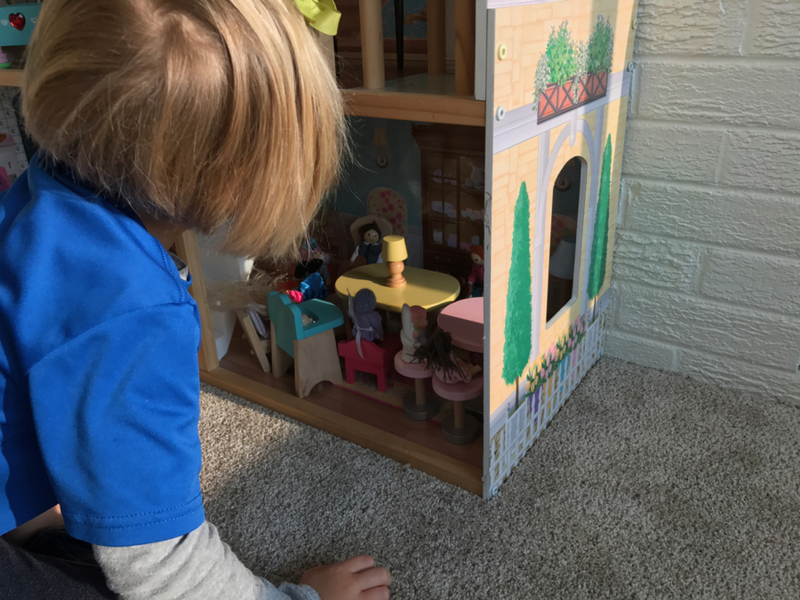 Evidently that won't stop Story from setting up the dolls in the dollhouse for their own story circle. We are doing a few devotions this month from an Advent book that my mom gave me a couple years ago. It is our first time using the book, so I don't know enough about it yet to recommend it. When I said it is our first time using this book, please read the word "using" very lightly. I have set the bar very low for how much of the book we will cover. There are three devotions per week and an excerpt from an original short story to be read sequentially week to week. My goal is to do one of the three devotions (in place of our story circle) and then to also find a night each week to read the short story excerpt as a family read-aloud time. Making an attempt feels meaningful in itself. I am thankful for how the first devotion time went on Sunday night for Week 1 of Advent. We talked about Isaiah's prophecy, 700 years before Jesus was born, of who the Messiah would be by focusing on the names given in Isaiah 9:6-7. While I read the devotion, the kids snacked and colored and kind of listened. I tried to keep it super simple and just really focused on the names Isaiah said the child, Jesus, would be called.